Errol: Most of the socials mentioned are ones we’ve had in my region, but I don’t think we’ve had a sushi social. Mmmm… spicy salmon. Oh! And here is the 2nd Episode of the NaNoMusical for you to watch! You can catch the first one here if you haven’t seen it yet! Debbie: I LOVE the 2nd NaNoMusical episode, Errol. Dale’s NaNoEmoAngst song is SO deliciously sincere. And Dale and Jill are just SOOOO CUTE together! 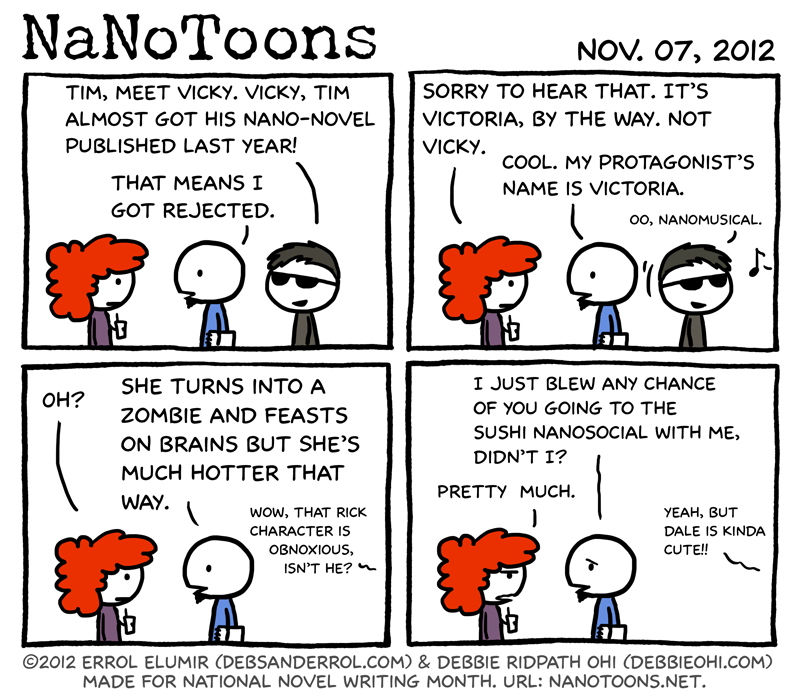 To all: If you need more NaNoComic distraction, you really should check out the daily comic on DebsandErrol.com (that’s Deb as in Deborah Linden, not me); Errol’s been writing about NaNoMusical recently.